Mike and Judy McDade bought their 1860's home in 1990 after falling in love with the house as well as Monroe County. In 1994, Judy quit her job and decided to go into business on her own. After trying a few basket kits, she decided basket making was worth a try. Armed with a little knowledge and time on her side, Jamit! Baskets began. After 30 years of book keeping for others, she already had the business experience and jumped in with both feet. In 1995, Mike and Judy attended a trade show sponsored by WV with Governor Caperton's blessing. The show was a great break for them. QVC Home Shopping Network chose their original design, the "Molly Basket", for their show "50 States in 50 Weeks". They had 10 weeks to produce 500 finished baskets. Mike and Judy set a goal of 50 finished baskets each week. They were very careful not to get ill, worked until 11 pm on weeknights, and even later on weekends. With drive and determination they finished their baskets in time, and were able to make the show, which they did live in Charleston. In five minutes of national air time they sold 200 baskets. The rest sold after the broadcast. According to Judy, "I tell this story because after we succeeded with this order, nothing was going to de-rail our goal to make it in the weaving business. Mike became my partner with this order. Without him I could have never gotten 500 baskets done in the time frame I was given." Mike and Judy are self-taught weavers. Judy says, "Books are our teachers. Learning different weaving styles and techniques is a good start to basket making. The best way to improve as a basket maker, is to keep doing it. There really isn't a wrong way of weaving as long as it works for you and you achieve the finished basket you had envisioned. Eventually the weaving medium you like to use will win out." 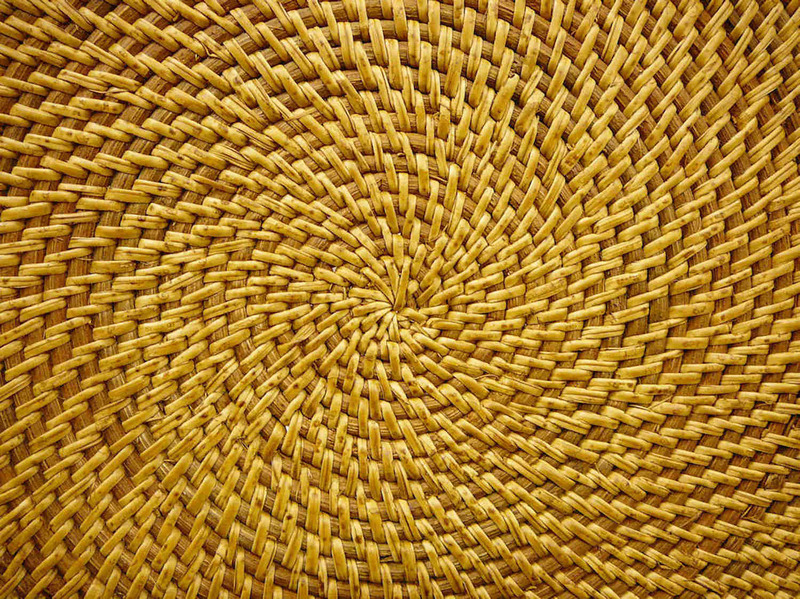 Judy prefers flat and flat oval reed for weaving, and likes doing production basket making. Mike prefers the "one of a kind" basket, and his are just that. He studies his wood, antler, wisteria or tree vine and visualizes the basket form. Mike's favorite weaving medium is round reed and seagrass. Row after row of any of these mediums will produce a strong weighted basket. Mike and Judy also grow willow. Each year they harvest the willow before Spring, cutting the rods down to the stool (rod base). Next, it is separated by type, tied and placed in a dry shed for a year. Last year's harvest is removed. Willow is a biomass material. It is beautiful through all the seasons, and makes excellent charcoal pencils and basket accents. Mike and Judy's house came with an established bamboo forest, and they are always looking for ways to incorporate bamboo into their baskets.